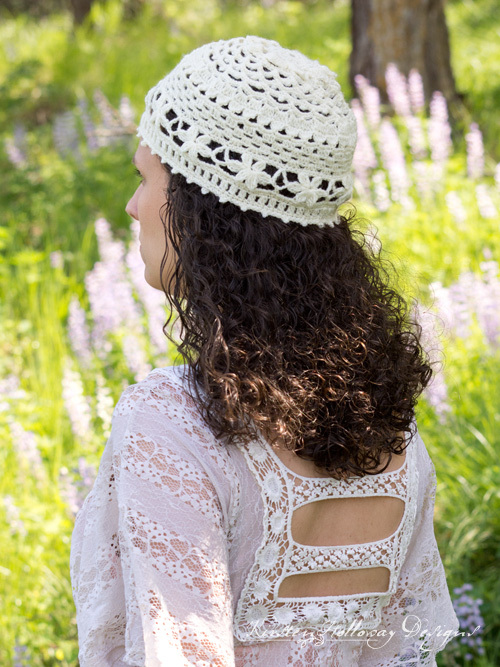 Love is in the air (also pollen, but we won’t go there), and this beautiful lace summer hat is a crochet pattern fit for all your warm weather adventures. It’s made using a wool/nylon blend sock yarn, which is unusual for summer, but it is so light weight and comfortable you’ll hardly know you’re wearing anything on your head! 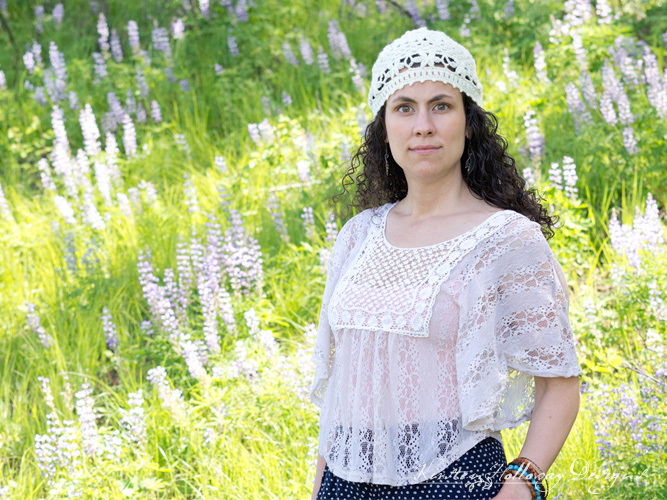 This crochet hat is meant to embody the loveliness of a garden with the free-spirit of a field of wildflowers. It’s filled with delicate floral accents, including a sunny floral motif at the top, and uses a variety of stitch patterns. 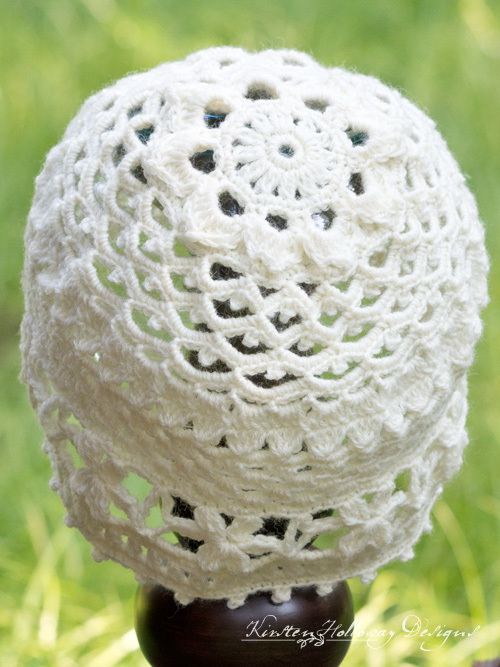 You won’t get bored making this captivating crochet design! Late spring/early summer are my favorite times of the year. Recent snow melt (we had snow on the ground until May 7! ), coupled with spring rains, bring the first wildflowers bursting forth in glorious array during the first part of June, with the symphony of colors becoming more brilliant as the month progresses. Patches of Lupine, Indian Paintbrush, and Arrowleaf Balsamroot (a member of the sunflower family) cover the hills and mountain tops with their beauty–it really is breath-taking. Standing in this patch of lupine, the richness of sun and shade mingled at the edge of the forest, and enhanced by gentle summer breezes, made for such a relaxing and rejuvenating experience! I hope you are able to catch some of the romance of the moment through these pictures and the crochet pattern. For this design, Lion Brand send me some of their versatile sock-ease yarn (hint: it’s not just for socks) which is a resilient blend of wool and nylon. It’s nice and stretchy which adds to its comfort! I chose the color “Marshmallow”, a creamy off-white hue, for its light summery look. Plus, off-white is one of my favorite colors to wear. It adds such a simple, romantic look to outfits. -Maintain very relaxed tension as you make your chains in rounds 6, 8, 10, and 12, otherwise your hat will become narrow and misshapen at the top. This section will pucker a bit as you work it, but should flatten out as the pattern goes on. -This is a summer hat and is short on purpose, ending about mid-ear level. 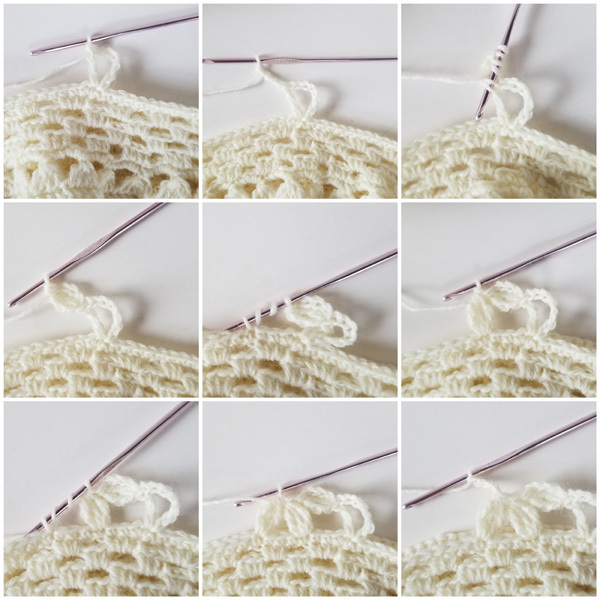 If you wish to lengthen it, I’ve added suggestions for doing so in the pattern body. 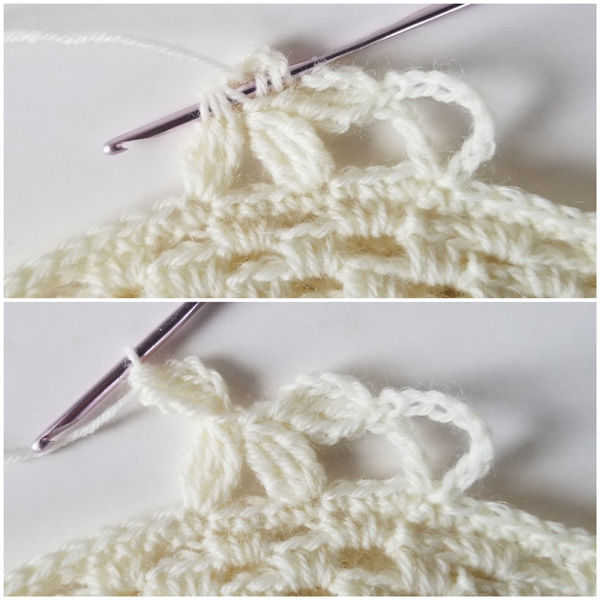 Keep your tension nice and relaxed as you make the chains across the next section, otherwise your hat will be very narrow at the top and not fit properly. If you chain tightly, try going up a hook size or two. Your circle may be a bit puckered at this point. It will straighten out as you add more rounds. This begins the flowers section. Take this one step at a time and look at the pictures below (scroll past the end of the pattern) if you get stuck. It may look complex at first glance, but it is a fairly simple stitch once you do a couple of flowers. You can use tighter tension in your chains here, but keep in mind, the next 2 rounds should add at least 1 1/4” to the height of the hat. By the time you get to the point of the pattern, the hat should measure at least 6 1/2” long. If it does not, you are welcome to use tr instead of dc stitches to make the clusters a little taller. 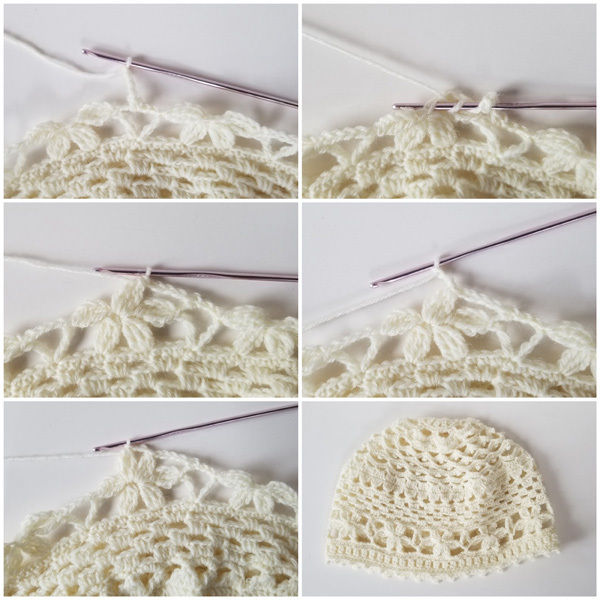 Friends, if you enjoyed this pattern, don’t forget to sign up for my newsletter, here That way you’ll never miss out on special events, or freebies I’m offering. Feeling wilted over the flowers from rounds 25 and 26? Round 25 (illustrated): ch 8 (counts as first tr+ ch 4), tr in same st, ch 4, tr2tog in top of tr just worked, sk 3 sts in round 23, tr3tog, sk 3 sts in round 23, tr3tog, ch 4, tr2tog in tr3tog just worked, sk 3 sts, *(tr, ch 4, tr) creating a large V-stitch, tr in same st, ch 4, tr2tog in top of tr just worked, sk 3 sts in round 23, tr3tog, sk 3 sts in round 23, tr3tog, ch 4, tr2tog in tr3tog just worked, sk 3 sts; repeat from * around. Round 26 (illustrated): sl st in next 3 ch to center of large V-stitch, ch 1, *hdc in ch-4 sp, ch 4, tr3tog in center of petals from round 24, ch 3, tr3tog in center of petals from round 24, ch 4; repeat from * around. This post contains affiliate links. When you purchase something from the link, I receive a small percentage of the fees at no extra cost to you. Really lovely hat! 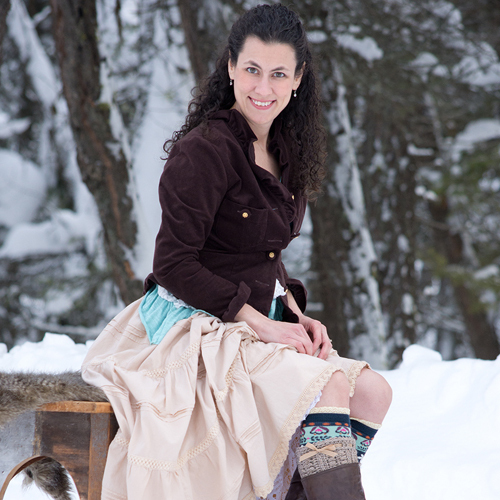 Thanks so much for sharing and great to “meet” you on craft schooling Sunday! Thank you for stopping by! A blogging friend let me know about your link party so I had to go and check it out! Love the pattern, I was wondering if cotton be used in the pattern. Like Peaches and Cream. You’re welcome, Tina! I’m so happy you like it! I do have some more ideas for summer hats. We’ll see if I can get one more out before fall! I love the lace summer hat. So beautiful. The lace shirt you are wearing is so very gorgeous too. Thank you so much. So many wonderful patterns. Thanks so much for your beautiful patterns. I have made several of the Wanderlust beanies for some of the “boys” in my family and they love them…. I keep receiving photos of them wearing their new hats…. and now they all want one…. My daughter even stole her husbands beanie, requiring me to hurry and make another for him…. Now I’m making the Wildflower Romance for my Granddaughter… It’s so beautiful and I love it and I know she will too… next on the agenda are a few more Wanderlust beanies and a seed stitch beanie or two for my grandsons …. I haven’t found such perfect hats anywhere else … the textures, fit, and ease of making them outshines the others in both design, style and functionality! Thank you again for sharing these wonderful patterns! You’re most welcome, Mary Ann! Your comment made my day. 🙂 I’m so glad you’ve found a few patterns you love, and that your family members also are enjoying the results!